Hi everyone! As you can see I ended up purchasing the shoes from the wishlist in my last post. I had my eye on them for so long and, given the amazing sale (& the fact that I already owned the matching handbag), I couldn’t resist. I seriously have such a problem with spending money. I truly feel I’ll never get anywhere in life because I cannot seem to get it under control. For now, I’ll just enjoy the shoes. I’ve never had a matching shoes and handbag set so it’s pretty exciting. They are both so dainty and adorable; most definitely my style. Ever since Alannah Hill released a number of duck egg blue pieces last winter, I’ve been obsessed with all shades of light and medium blue. The shoes and handbag are such a beautiful unique shade; I’ve never seen such items in this exact colour before. 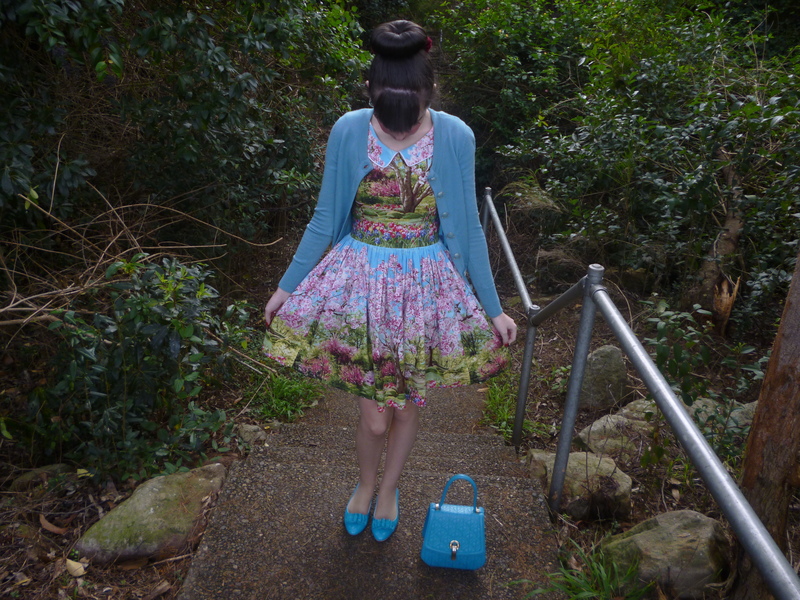 When deciding what to style them with, my Bernie Dexter dress jumped out at me. I love the way the blue accessories highlight the blue on the dress. I first posted this dress here when I attended the races last year. 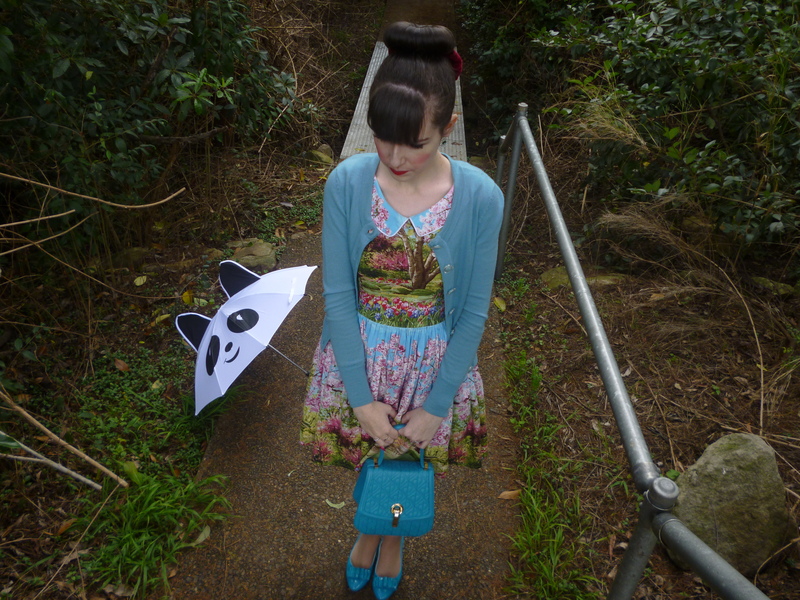 It has remained one of my favourites and most worn dresses. I love wearing it to work to brighten up the day. It’s actually quite versatile given the numerous amount of cardigan combinations. 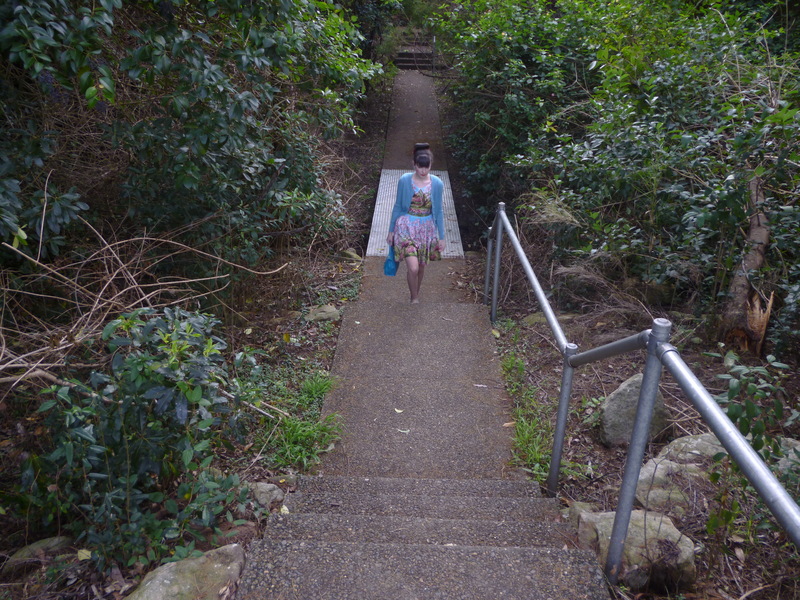 Also, as I said at the time, I know many bloggers own this dress and that makes me feel part of the club. It’s so nice to have such a beautiful dress which reminds me of my friends from around the world. 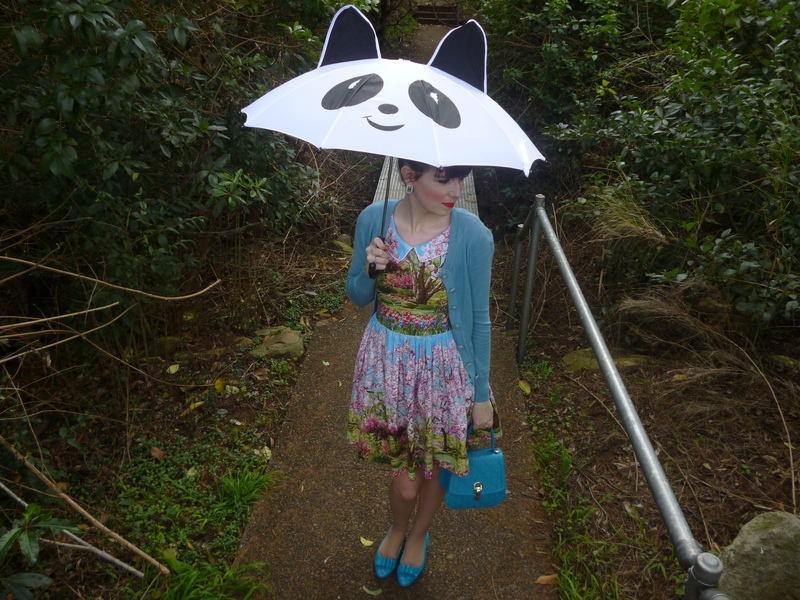 I finally had the chance to use my panda umbrella for the first time last week. I’d never wanted it to rain so much; I’d been waiting so many weeks. 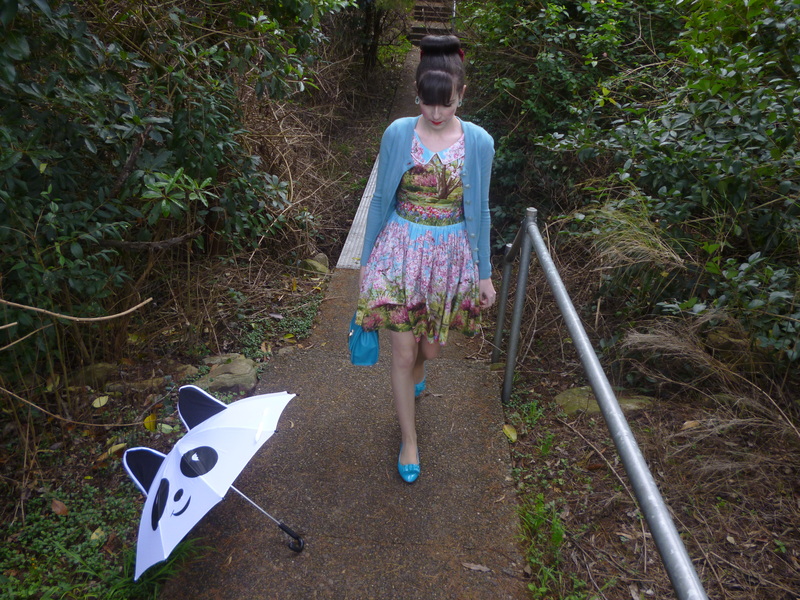 There should be rain this week so I will have more opportunities to show off my exciting panda. I’m returning to work tomorrow after an absence of ten days. I was at college last week so had to take the time off work. I’ve never had such a long break from work; it feels like I’ve missed so much. College was very difficult; it was even more challenging and out of my comfort zone than I expected. It was stressful and a lot of work. The week mainly compromised of oral style assessments such as client interviews, oral exams and mock court cases. As the most shy and insecure person ever I cannot even explain what it took for me to get through it. My anxiety was at maximum levels again. I’m pleased with myself for getting this far and am so relieved it’s over. However, I’m worried for the next on site week in a couple of months and cannot wait for the course to be over. I mainly just find it so demanding with a full time job; so frequently I’m scared I just won’t be able to cope any more. Stay focused until 22 August, I just hope it’s worth it. 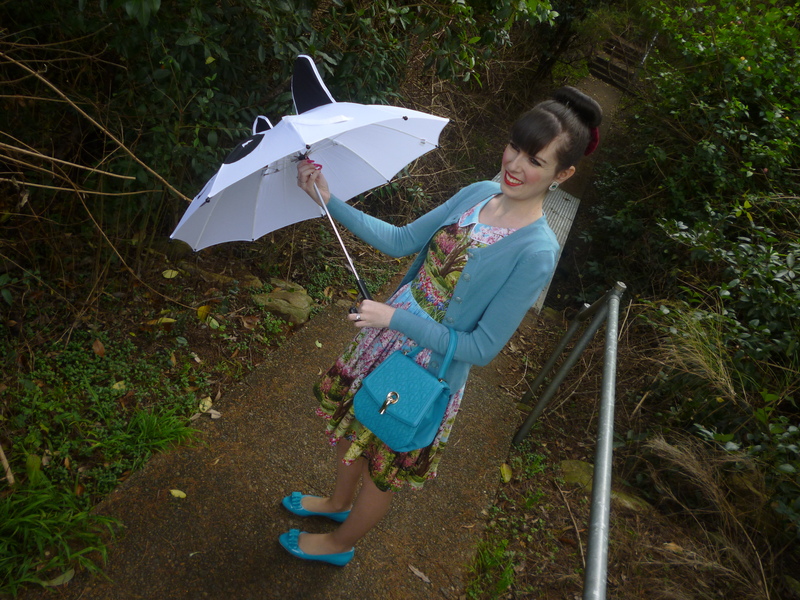 This entry was posted in Alannah Hill, Modcloth, Outfits, Uncategorized. Bookmark the permalink. Only a couple months left! I'm sure you'll be fine! I'm bad a spending money too! Going to put myself on a spending ban, I think! You look so cute in the matching shoes! The dress is the prettiest print too. Hang in there with college, it will all be worth it despite how tough it can be sometimes! I can totally see why you love the dress so much. Its really cute and looks great on you! 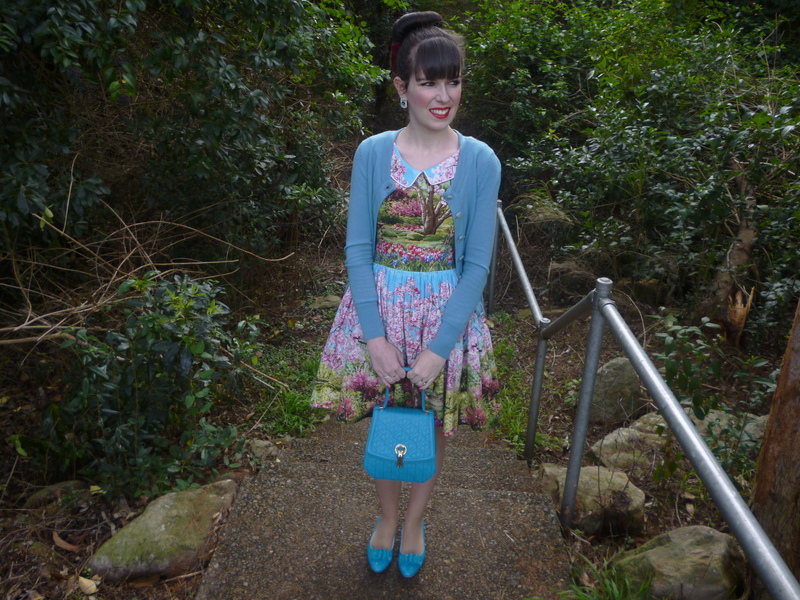 Love the cardi and bag and shoes with it! Okay this dress is amazing and I love all the blue accents! Love it all. Thanks so much for linking up!